Sister Kathleen Woody (Sister Ann Sharon) was born in Richmond, Virginia, and retains many of the remnants of her days in the South. She met the Grey Nuns of the Sacred Heart at St. Norbert’s Parish in Paoli, Pennsylvania. As an elementary teacher, she served at Melrose Academy and Grey Nun Academy before beginning an almost lifelong ministry at St. Joseph’s Preparatory School in Philadelphia, a Jesuit high school for boys, commonly referred to as The Prep. At that time, she was one of the few women faculty members and began her career as an English teacher. Her role there evolved into that of Campus Minister which she held for many years. 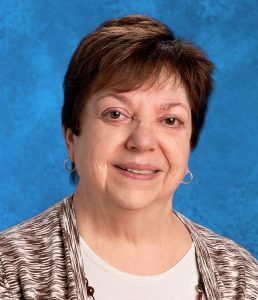 She continues on the faculty at The Prep in a part-time basis as a teacher of religion. When I entered the Grey Nuns in 1967, I thought I knew how my life would unfold. However, things quickly changed. The habit was replaced with secular clothes, we began to live in intentional communities, and I went to work in a non-Grey Nun institution. I learned about social justice issues. I collaborated in ministry with religious from other communities. I was introduced to new forms of prayer that helped to deepen my spiritual life. I foresaw none of this. Truly, our God is a God of surprises! During these 50 years I have certainly grown in age, but, hopefully, in wisdom and grace as well. I know I am a better person for my experiences as a Grey Nun. Hi Sr. Kathleen! Thanks for teaching us songs and hymns. I specifically remember “What would Della wear? She wore a brand New Jersey” song. We missed you when you left us. Congratulations, Kate! Thanks for sharing your many gifts with us and with so many others. Blessings in abundance! Congratulations! Hope you have many more years of service, good health, and happiness. Look forward to seeing you .